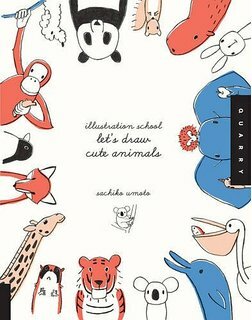 Years ago I bought Illustration School: Let's Draw Cute Animals by Sachiko Umoto and loved everything about it, from the simplicity and clarity of the instructions (this is definitely a book kids can use without an adult's help, even if they can't read) to the, well, the cuteness of the animals. My kids have outgrown this book, so I put it on the shelf in my library at school and it is very popular. 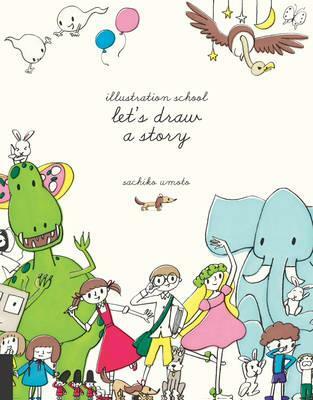 I am SO excited to be reviewing Illustration School: Let's Draw a Story! But, before I delve into the very cool format for this book, I want to share some a passage from the letter to readers at the start of the book. 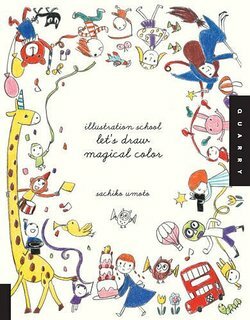 Umoto encourages readers to "put your heart and soul into it, and just draw," telling readers that even if they copy the drawings or trace the designs, "each version will be different - it will never be the same story twice!" I LOVE that advice. Kids (and even adults) hassle each other about tracing and copying drawings, but this is in fact one of the best ways to learn how to draw. Tracing and copying are like training wheels and eventually artists will take off on their own. 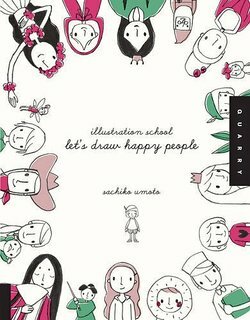 Umoto ends with words I especially like, telling readers that by "drawing your own world, it becomes part of reality and connects it to the world that we all share. . . You can make connections with lots of people by sharing the joy of creating something with your own hands." Illustration School: Let's Draw a Story begins by getting artists set up, even noting the best way to erase something from the page. Then she covers the basics, with tips like draw larger shapes first, apply different pressure to the tip of your pen and let the colors inspire you. The rest of the book is comprised of a story about a princess who escapes from her story to get help from twins Pen and Rayon and their dogs, Book and Marble. The princess, who is to be named by the artist, begs Pen and Rayon to return order to her world, where the Eraserheads have erased everyone on her island home. There are 29 scenes in the book, and each one has a similar format. The story unfolds while at the same time artists/readers are invited to engage with the story by adding text and replacing lost illustrations. Artists can trace over existing illustrations, but there is also room for them to add their own artwork to the story. Umoto's illustrations are in color when she is in storytelling mode and grey and light grey when engaging with readers. 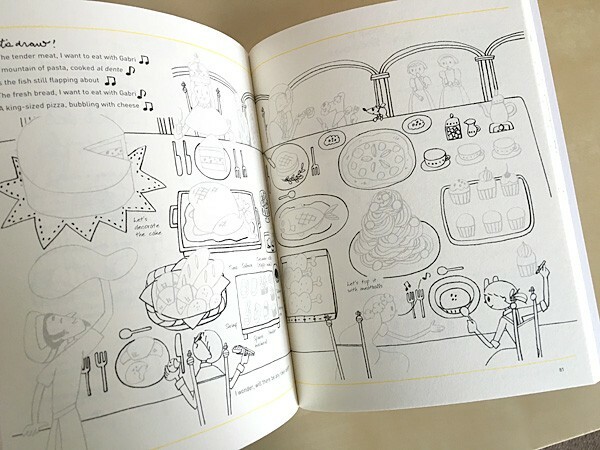 Incorporated into the story are spreads where Umoto gives step-by-step instructions on how to draw everything from animals to food to weather to facial expression, all with the clarity and simplicity of her previous books. 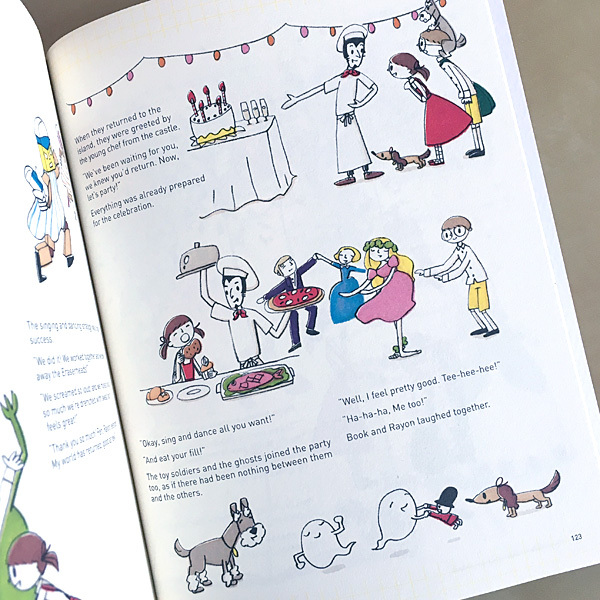 The story itself travels through many scenes, giving artists experience drawing an array of things, from a desert to a castle to a monster island and a robot island as well as inviting them to decorate a room, draw a meal and draw a costume contest. 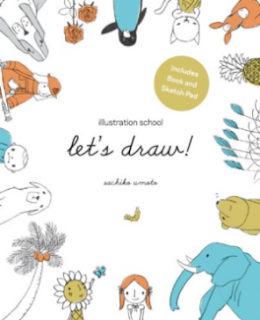 Illustration School: Let's Draw a Story is the perfect book for any creative kid in your life, but it is ideal for travel, snow days and sick days.